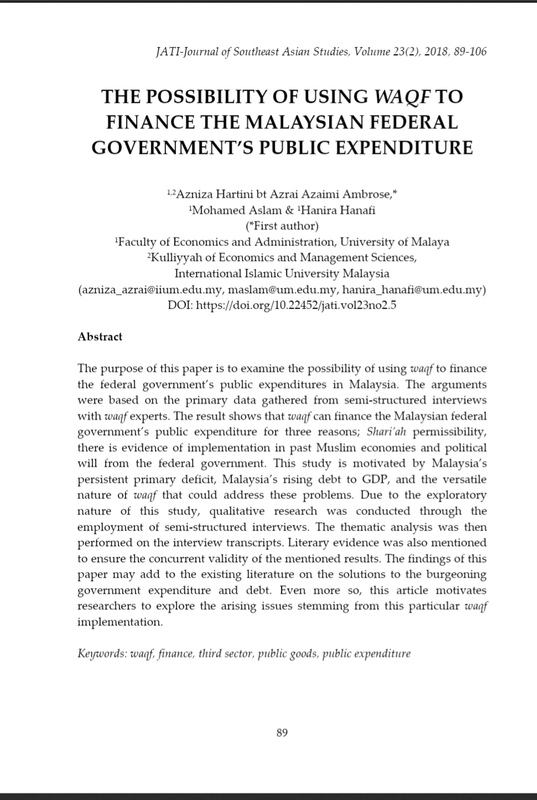 The purpose of this paper is to examine the possibility of using waqf to finance the federal government’s public expenditures in Malaysia. The arguments were based on the primary data gathered from semi-structured interviews with waqf experts. The result shows that waqf can finance the Malaysian federal government’s public expenditure for three reasons; Shari’ah permissibility, there is evidence of implementation in past Muslim economies and political will from the federal government. This study is motivated by Malaysia’s persistent primary deficit, Malaysia’s rising debt to GDP, and the versatile nature of waqf that could address these problems. Due to the exploratory nature of this study, qualitative research was conducted through the employment of semi-structured interviews. The thematic analysis was then performed on the interview transcripts. Literary evidence was also mentioned to ensure the concurrent validity of the mentioned results. The findings of this paper may add to the existing literature on the solutions to the burgeoning government expenditure and debt. Even more so, this article motivates researchers to explore the arising issues stemming from this particular waqf implementation.